At first, applying for and going to college may seem like a daunting task; however, your military service has actually prepared you for this. You already have some of the skills and experience required to achieve success in school. Maturity. Serving in the military before going to college or university gives you a leg up in the maturity department. Rather than being a fresh-faced 18-year-old, you’re likely in your mid-to-late 20s or older when starting college. Those extra years and life experience can better prepare you to handle the demands of your education. Problem-solving and stress management. Although the stress you faced during your years of service is much different from what you’ll encounter at school, your military service has prepared you to solve complex problems, think critically, and perform under pressure. Education credits for military services. You may be able to receive general education credits for your military experience. Be sure to speak with an admissions advisor about whether you are eligible and how to get credit for your service. Furthermore, going to college after the military has many benefits for veterans that extend beyond your education. Readjusting following military service. Returning to civilian life can be challenging for veterans like you. Whether you’re taking classes on campus or online, you have the opportunity to connect and interact with civilians of all ages and backgrounds. Networking and community. As a veteran in college, you’re not alone. Many schools have resource groups for veterans or a veteran-specific orientation that can help connect you with people of similar backgrounds. This interaction can also help to ease your exchanges with potential employers and companies, as you’ll already be used to working alongside civilians in a classroom setting. Learning to settle into a routine. Coming from a military background, you’re used to a regimented schedule, often where a higher-ranking person sets out the direction for your day. At school, however, you’re the one responsible for registering for classes and determining a schedule, and you’re required to take ownership of your daily routine. Fortunately, many schools offer assistance in these areas for veterans who need support with this adjustment. Better career prospects. Going back to school allows you to develop new skills and build upon the ones you learned in the military. This extra education can pay off in a big way, too: One study found that workers with a bachelor’s degree earned an average of $31.93 per hour, whereas those with only a high school diploma earned an average of $17.25 per hour. There are a variety of ways to earn a degree as a veteran in college. You don’t have to commit to a full course load or a program that requires you to be on campus five days a week. There are flexible degree programs, weekend and evening classes, online programs, and blended learning programs available to you at many universities and colleges. Am I a self-directed learner, or do I want live instruction? Some online courses are more self-paced with occasional specified check-ins throughout the semester, while others have live webinars and lectures that students are required to attend at a specific time. Does this degree program accept credits for military service? Be sure to speak with an admissions adviser to ensure you’re getting the most value out of your service. Are the school’s veterans resources available to online students? 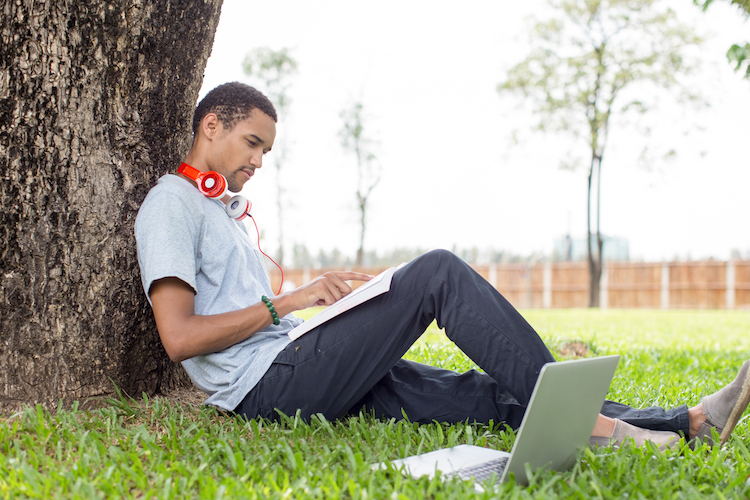 You’ll want to make sure you can still get the support you need as a distance learner. If you’re considering going to college after the military, there are plenty of financial assistance and grant programs out there that can ease the economic burden of earning a degree. One of the most well-known financial aid sources available to veterans is the Post-9/11 GI Bill. Since 2009, the Post-9/11 GI Bill has contributed over $55 billion to providing a college or university education to veterans. What is it? The Post-9/11 GI Bill provides educational benefits to active-duty service members and veterans. Do I qualify? If you have an aggregate of at least 90 days of active-duty service after Sept. 10, 2001, and were honorably discharged or were discharged with a service-connected disability, you may be eligible for this program. You may also qualify if you are still on active duty. For more information on the Post-9/11 GI Bill, visit the Veterans Affairs website. What does it include? Veterans in college can receive a percentage of their tuition and fees, as well as a monthly housing allowance. If you’re seeking benefits for out-of-state or private tuition, the Yellow Ribbon Program may be able to assist you. Federal Student Aid: Receive low-interest loans, as well as grants, from the federal government for your studies. Scholarships: Many colleges, nonprofit organizations, and other groups offer scholarships for veterans and their families. You’re leaving the military armed with skills and life experience, so why not put those tools to work? Here are some potential career paths for veterans in college to consider. However, it is important to remember that while a degree can start you down the path towards accomplishing your professional goals, additional degrees, certifications, or training may be required to achieve employment. Remember to consult the requirements for any position before applying. Skills: Your experience in the military will prepare you to transition into civilian law enforcement. A criminal justice degree can build on that foundation and prepare you to begin the process of entering the world of policing. The logic, critical thinking, and leadership skills you developed in the military will serve you well in this program and its related careers, as will your physical and mental training and toughness. Skills: Did you spend your years in the military working as a cryptographer, cyber operations officer, or network defender? If so, you might be well-suited for a cyber security program that teaches you how to prevent, investigate, and respond to network security breaches. Career Opportunities: If you graduate from a cyber security program, you may go on to work as an information security analyst. You’ll be responsible for monitoring an organization’s networks, investigating security breaches, and protecting sensitive information through the installation and use of security software. Information security analysts made a median salary of $92,600 in 2016. The field is projected to grow 28 percent between 2016 and 2026. Skills: You know firsthand the impact that military service can have on an individual’s mental health. A bachelor’s degree in psychology can be an important first step in beginning a career that allows you to support other veterans who are returning from military service. You may be able to specialize in military psychology or forensic psychology with further education. Career Opportunities: According to the Bureau of Labor Statistics, psychologists made a median salary of $75,230 per year in 2016, and the field is growing faster than average. Skills: Apply your leadership and organizational skills to a career in business administration. You’ll enjoy the versatility of the degree, and learn the business tools required to find success in the public, private, and nonprofit sectors. Career Opportunities: A degree in this field can open up a variety of career paths for veterans, including management positions and jobs in advertising, sales, marketing, finance, or human resources. The median annual wage for business and financial occupations was $66,530 in 2016. Skills: If you worked in military communications or information systems, consider a degree in information systems management. You’ll potentially advance your skills in a variety of information technology areas, including information security, business data, and project management, and you’re likely to boost your general business knowledge, as well. Career Opportunities: Graduates of an MIS program can go on to pursue an array of jobs within IT, including systems administrator, analyst, or architect; software developer; database administrator; or networking specialist. Computer and information systems managers made a median wage of $135,800 in 2016. It’s time to take control of your future. Take advantage of your military experience and pursue a rewarding education that can potentially lead to future career success. To learn more about how you can start the process of going back to school for a bachelor’s, master’s, or doctoral degree as a veteran, research your options and contact an enrollment adviser today. Welcome home.